Impulse control, mental flexibility, working memory, oh my. Deficits in these areas are at the root of many school counseling referrals. Learn how you can best support students lacking these skills. Download accompanying handouts here. List the skillsets involved in executive function and self-regulation. Identify the primary tasks for executive functioning and self-regulation development throughout the elementary years and beyond. 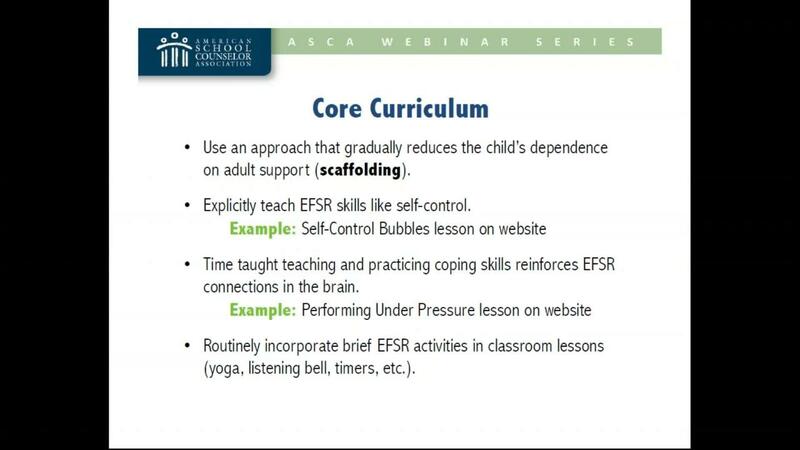 Use provided individual, group and classroom interventions to foster executive functioning and self-regulation skills. Discuss how to share this information with parents and teachers to create a partnership of support. Claire Brantley is an elementary school counselor in southeast Virginia, who believes the greatest work with students happens through creative, multisensory strategies that bring abstract concepts to life and equip children to take an active role in problem solving. She has shared program results and reflections in the Virginia School Counselor Assocation's Voice Magazine, as well as in presentations at American School Counselor Association annual conferences.